There are two ways to look at Mark Zuckerberg's comments on Wednesday, his first since the Cambridge Analytica crisis unfolded. They showed either a chief executive getting on top of the situation, and making what sounded like significant concessions in areas we wouldn't expect. Or, it was a skilled, composed display of PR spin - a media appearance for which he had almost six days to prepare. Speaking to CNN's Laurie Segall, Mr Zuckerberg made it look like he was giving up a lot, while simultaneously dodging the big issues. Yes, he said he welcomed more regulation - but in a way that wouldn't have that much impact on Facebook's business at all. Yes, he said he would be "happy" to testify before Congress and other committees around the world - but immediately gave himself the get-out clause he has used to avoid all of the other hearings so far. Yes, he did say sorry - but only for the situation, not specifically for the actions of his company. Simply - Mr Zuckerberg did enough to buy some time as he tries to get his company in order, but not much more than that. His comment - "I actually am not sure we shouldn't be regulated" - seemed like a major admission that the time may have come for stricter rules on his business. In reality, he was advocating for a bill that would arguably have more impact on the people who advertise on Facebook than Facebook itself. "I think there are things like ads transparency regulation that I would love to see," he told CNN. He was referring to the Honest Ads Act that's being debated by US politicians right now, a proposed law that would force buyers of any online advertising relating to candidates in an election campaign to be more transparent about funding. In other words, the internet equivalent of messages like "I'm Donald Trump and I support this message" being tacked to TV spots. The Honest Ads Act would also require companies like Facebook to take "reasonable" steps to determine that no foreign power was buying ads. Here's what's worth knowing: following the fall-out over Russian-bought ads in the 2016 US presidential election, Facebook said it created the tools needed to handle political ad spending better. So if the Honest Ads Act was passed today, chances are Facebook would already be in compliance. In the days following the Cambridge Analytica revelations, several investigatory committees in the US and Europe said they would be calling on Mr Zuckerberg to testify in person. "The short answer is I'm happy to," he told CNN. "If it's the right thing to do." This has been Mr Zuckerberg's position all along. In the past, he's sent people like lawyer Colin Stretch, who took the lion's share of questions when the social media companies were summoned to Washington late last year. When it wasn't lawyers, the company opted to send specific department heads, such as policy boss Monika Bickert. But to be fair to Facebook, this is a valid approach. If Mr Zuckerberg is a good boss capable of delegating effectively, his department heads would certainly know more about their respective areas than he would. It's worth remembering that when it comes to political theatre, those calling Mr Zuckerberg to Washington would enjoy very much the chance to look tough and impressive when dealing with a powerful tech leader. "That's not a media opportunity - or at least it's not supposed to be," Mr Zuckerberg told CNN. The investigations looking at Facebook are focused on areas advertising, manipulation, consent and safety. Facebook has a top expert for each of those areas. But Mark Zuckerberg, it's entirely reasonable to say, isn't one of them. When his initial statement was posted, those who read it noticed something immediately: he didn't say sorry. Later, in follow up interviews - he appeared to offer something of an apology. "So this was a major breach of trust and I'm really sorry that this happened," he told CNN, and repeated in similar words to Wired magazine, tech publication Recode and the New York Times, all of which were given interviews on Wednesday. And he is "sorry" - sorry that the company's missteps and naivety (his word) led to $50bn being wiped off the company's value and reputational damage from which it may never fully recover. His words today expressed an apology for the result, not the cause. Remember, it's possible to feel sorry for one's self. For me, the most surprising remark Mr Zuckerberg made today was his answer to a question from the New York Times. "Are you giving any thought to allowing Cambridge Analytica back in?" asked the newspaper's reporter, Sheera Frenkel. "We’re certainly not going to consider letting them back onto the platform until we have full confirmation that there’s no wrongdoing here," Mr Zuckerberg said. Mr Zuckerberg's recent struggles as chief executive have been because of his inability to understand the root of the public's anger. First on fake news, and now this. Some people think that the public is less concerned about the specific nuances of whether or not a policy was breached, and more about the broad ethical stance of Facebook on the use of its data to achieve the aims that Cambridge Analytica promises its clients. 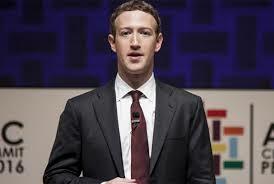 Mr Zuckerberg had the chance to say such activity was no longer welcome on his network, but chose not to take it.